A beautiful witch uses her powers of seduction, with fatal consequences for the men she meets. "They don't make 'em like they used to" is a refrain often heard regarding the quality of modern cinema. It's a statement that simply doesn't hold up in a year in which the Oscar is almost certain to go to a film that exists almost solely to appeal to nostalgia for Hollywood's golden age of musicals. As with Damien Chazelle's La La Land, Anna Biller's The Love Witch, her first feature since 2007's Viva, is a pain-stakingly crafted homage to a cinematic past, but it's far more successful in representing its thesis. 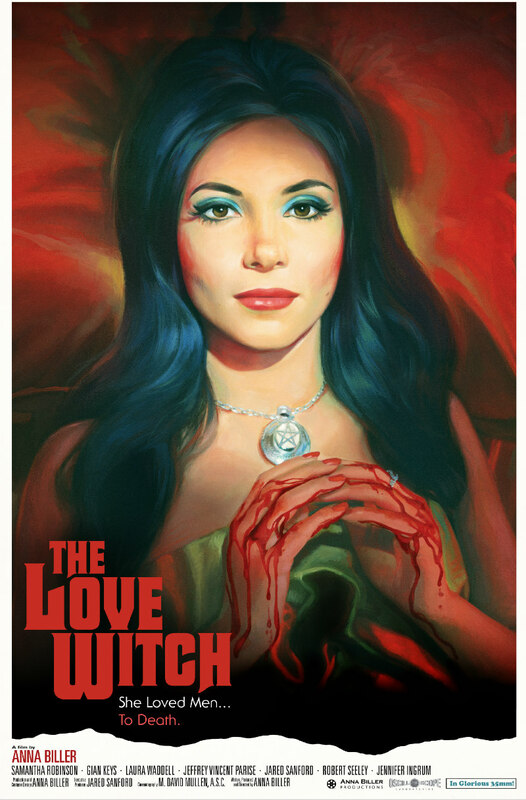 Like a Jess Franco movie remade by Betty Thomas, The Love Witch is a genre-inspired comedy as black as a witch's cat, a loving tribute to mid twentieth century pop culture's obsession with the occult. Its protagonist, played in an instant star-making turn by British actress Samantha Robinson, is Elaine, a beautiful young witch who flees San Francisco following the not so ambiguous death of her lover. Relocating to small town California, she instantly sets her sights on replacing him with a new beau, using a variety of spells and potions to ensnare men. That someone who looks like Robinson would need such extreme methods is one of the film's most ridiculously gleeful conceits. The trouble is, Elaine's potions work too well, with the men she seduces literally dying of broken hearts if they're separated from their seductress for brief periods. All except investigating Detective Griff (Gian Keys), whose determination to remain free and single proves resistant to even Elaine's charms. Biller uses this simple plot for a profound, and profoundly hilarious, examination of the battle of the sexes. While Elaine and Griff make love, we hear through voiceover their vastly different interpretations of the relationship, the former looking forward to falling in love with her prospective mate's idiosyncracies, the latter lamenting the inevitability of his eventual disinterest. The male ego takes a real beating here, but we're not told anything we can deny. As a man, watching The Love Witch is like a date with a witty girl who sizes you up immediately and spends the rest of the evening ripping you apart with sarcastic jibes - it's great! When Biller premiered her film at last year's Rotterdam Film Festival, it was the only new movie in the fest that was shot on 35mm film. The filmmaker has gone to great lengths to replicate the look of technicolor, and it's a thing of beauty. Though it's set in the modern era (cellphones are present), an unsuspecting viewer might assume it a product of any time between 1950 and 1979. Every frame is meticulously composed, lit and filled, to such a degree that it makes a mockery of the televisual blandness of most of modern cinema. Two viewings are probably required to really appreciate The Love Witch, as you'll spend so much time examining the intricately detailed backgrounds of scenes you might miss much of the dialogue and foreground action. And then there's the gloriously loungetastic score, composed by Biller herself. The visual invention extends into the storytelling; The Love Witch boasts what may be the greatest match cut since Lawrence of Arabia. If you see only one movie on a cinema screen in 2017, make it this one. Biller seems to have used sorcery of her own to tap into my brain and deliver a movie specifically designed for my obsessions with cult cinema. Or maybe she just took a look at my blu-ray collection, to which I look forward to adding The Love Witch. Her movie is the very definition of 'niche appeal', but if, like me, you're at the epicentre of this particular niche, it really is quite something to behold. It's a uniquely singular vision (as well as writing and directing, Biller produced, scored, edited, and designed the sets, costume and general production of her film), one that leaves you in no doubt that its creator loves cinema, and is determined to leave her own mark on its history. A considerable portion of the festival audience walked out of The Love Witch, but the rest of us were captivated by its spell and remained entranced. Had some raven-haired temptress plunged a knife into my chest when the credits rolled, I would have died with a smile on my face. The Love Witch played at the Audi Dublin International Film Festival and is in UK cinemas March 10th.